Huge Life Size Realistic Jason Machete Knife faux toy prop with realistic blood splatter. Give friends a fright with this classic dreaded costume accessory weapon like the one used by horror's most feared masked man, Jason Voorhees. 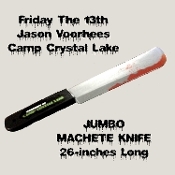 Nobody is safe at Camp Crystal Lake when Jason has this JUMBO size 26-inch Long bloody blow molded plastic machete knife! Behind the iconic hockey mask is Jason Voorhees, arguably the most recognizable face of American slasher films. Relive the terror you felt when you first saw Friday the 13th with this officially licensed Jason Voorhees weapon. Add a classic hockey mask (sold separately) and you have all you need to terrify your friends with a horror themed party celebrating this legendary film series. Handle imprinted 'Property of Camp Crystal Lake'. Twenty-six inch long deluxe blow molded plastic machete. Celebrate the original Friday the 13th horror film series. This super cool plastic fake weapon accessory will accent any zombie, vampire werewolf hunter or horror movie character cosplay costume. Plastic design is durable and easy to wipe clean. Approx 26-inch (65cm) long. Officially Licensed Jason Voorhees Friday the 13th product. *Warning: Not a child’s toy.